1. Cut 4lbs of red potatoes in half or quarters and toss them with about 1/2 cup olive oil and 2 large cloves garlic, pressed. 3. 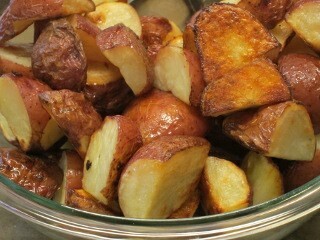 Line 2 9×13 pans with parchment paper, add the potatoes, and cover them with foil. 4. Bake at 425 degree oven for 40 min. Uncover and bake for 30 more minutes.